So Brian’s FAVORITE (and I mean FAVORITE) thing to work is his chest…and upper body in general. These are his 10 FAVORITE upper body exercises. 1. Bench – Ok who doesn’t love bench!?! Barbell Flat Bench is by far Brian’s favorite. It is a GREAT compound exercise. And as Lisa mentioned, “Strengthening your “man pecs” helps keep the twins perky!” The bench press works your pecs, triceps, shoulders and abs among other things! Here is an article about the flat bench press. You can also vary up your bench press by doing incline barbell or dumbbell variations. There are also other tortuous variations such as pause bench…but that is an exercise for another day. 2. Push ups – Brian thinks push ups are easy…I don’t exactly agree but I do think they are awesome for you! Push ups are one of those exercises that you need to actually DO to get better at. Doing bench and such will help, but to truly get good at push ups…you need to DO push ups. Girls don’t just do push ups from your knees because you are girls!!! Channel your inner man and bust them out from your toes or even attempt a decline push up or two (or 10). 3. Dips – You can do these off a bench or from a dip machine, but DO THEM. I find the ones off the bench much easier than full dips, but both can be good. I feel that the ones on the bench pretty much only tire out my triceps while the full dips from the bars work my chest, lower traps, triceps and my anterior deltoid (the front of your shoulder). Full, off the bars dips. 4. 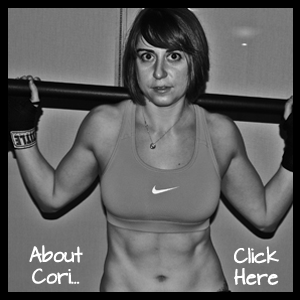 Wide grip pull ups – I happen to agree with Brian about these….I LOVE PULL UPS! THEY ARE AWESOME! Wide grip are especially awesome because they are hard and they isolate your lats. Regular pull ups tend to use a lot of bicep so these are great to mix in to just work your back! 6. Seated DB Military Press – If you want to improve your bench and push ups, you need to strengthen your shoulders. Military press is a great way to do that. Using dumbbells engages more stabilizer muscles in your core and shoulders. Doing the military press seated instead of standing can also be safer if you aren’t as sure of form – just make sure your back is fully pressed into the back of the seat. 7. 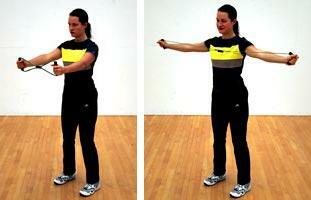 Front to Side Raises – Shoulder murder. 1 rep is a front raise and then a side raise. 8. Posterior Deltoid Flyes (with a resistance band) – Brian loves this one because no one works on their posterior deltoids. He says, “They are neglected. People focus on the anterior and medial deltoid.” (Brian also mentioned the fact that Candy has what we jokingly call “monster anterior deltoids.”) Choose a resistance band that you can stretch all the way out while having your hands about shoulder width apart. 9. Straight Bar Bicep Curl – This hits every aspect of the bicep. Don’t cheat – go all the way down and all the way up and DON’T SWING! Stagger the feet if you need to. BUT DON’T CHEAT! 10. Skull Crushers – Please don’t crush your face when you do these. Grab dumbbells and lay flat on a bench or floor. Bending at the elbows and keeping your triceps perpendicular to your body, lower the weights down toward your head. Try to keep your elbows in. Stop before you hit your face and straighten the arms back up without any flexion of the shoulder. Some others that Candy and I love that weren’t on Brian’s list: Dumbbell pullovers and Iron Cross. Iron cross is also shoulder murder and DB pullovers are a great exercise to work your chest, back and triceps all at the same time! If you do a pullover while holding a glute bridge, you get the added bonus of working your core, glutes and hamstrings. I hate Overhead Tricep Extensions…UGH! We both hate manual tricep pushdowns (which almost made Brian’s list).